I have been doing a bit of pleasure reading of late, a luxury that the constant pursuit of academic rigor does not always allow for. Giuseppe Spadafora of the Edna Lu Free Tea bus recommended “The Gift (Creativity and the Artist in the Modern World)” by Lewis Hyde. I must say, it is a fine and fitting departure from the in-depth study of Western Biomedicine that I have undertaken for the past 18 months, while saving to join the NCCAOM and take the first of 3 Acupuncture Licensing exams required in North Carolina. Unless you are one of the strange breed that calls themselves a Licensed Acupuncturist, you wouldn’t know that after 3 or 4 years, and a considerable monetary investment made in graduate school, achieving an advanced degree in our field, there are still 3 or 4 expensive and difficult qualifying exams (depending on your state) that must be undertaken in order to practice. I daresay that a modern Acupuncturist, practicing in the USA has spent as much money, time and study in the loving pursuit of helping their fellow man overcome pathology as any other licensed physician, though we do not often see as much of a monetary return on that investment. This is one of the reasons that I love Chinese Medicine. Acupuncturists love intellectual discourse on subjects such as etiology, pathology, strategy and treatment. Our studies never cease, even after our credentials are completed. On Saturday, December 29th, as I pressed the “Enter” key to reveal that I had passed my first, very-hard-won qualifying exam, I found myself audibly sobbing, overcome with a mix of emotions not easily explainable. Deep gratitude was definitely one of them. It was as if the magic “Enter” key had invited me in, to a world that I had worked long and hard to prove I was worthy of entering. It was my intention in this post, to mention each person’s name who has helped me achieve this significant milestone, but I realize now that this post would be nothing but names of teachers, family, friends, employers, and colleagues. From the kind encouragements from other Acupuncturists I have received daily in my job, to the real financial and practical assistance I was also given, I am humbled at the generosity of the human spirit. “Thank You” can never be enough, though it must be said, as inadequate as those two words seem, to my very full heart. My next challenges are the subjects of Chinese Medical Theory and Point Location and Treatment Protocol. But just for a month, before embarking on these next steps toward licensing, I am reading about being an Artist in Hydes modern classic that folks like Johnathan Letham say is “a life changing epiphany.” My undergraduate work was in Speech and Theatre. I practiced Performance Art as Medicine for many years. It is my belief that Art is Medicine, and that Medicine should be practiced as a kind of Poetry. Acupuncture and Chinese Herbalism are just that for me. Nurturing myself as an Artist is a very important component of my Medical practice, as is nurturing the Artistic Soul of my beloved patients. The upcoming Love Burn in Miami, Fl is the focus of my creativity at present. I am taking time to prepare Huang Di (my bus), rehearse a performance piece on the subject of Love, and gather materials and ideas for “Tea Talks”, Ceremony, and Panel Discussions on Relationship and Healing. In the spirit of the “Gift Economy”, my journey to Miami is fueled by gift. (Please private message me on Facebook or here if you would like to contribute.) It is also offered as such. This feels like a very fitting “Maiden Voyage” of Huang Di: The Yellow Emperor: A Mobile Acupuncture and Herbal First Aide Clinic. As in ancient ritual, the Burning Man Culture promotes and executes the ceremony of burning effigies of Man (and Woman.) It is a collaborative, interactive, non-commodification gathering in which all participants are invited to bring their “Gifts” and circulate them. This time honored practice, according to Hyde (and many other anthropological scholars he quotes) is what keeps the “gifts” or talents of the Artist flowing. 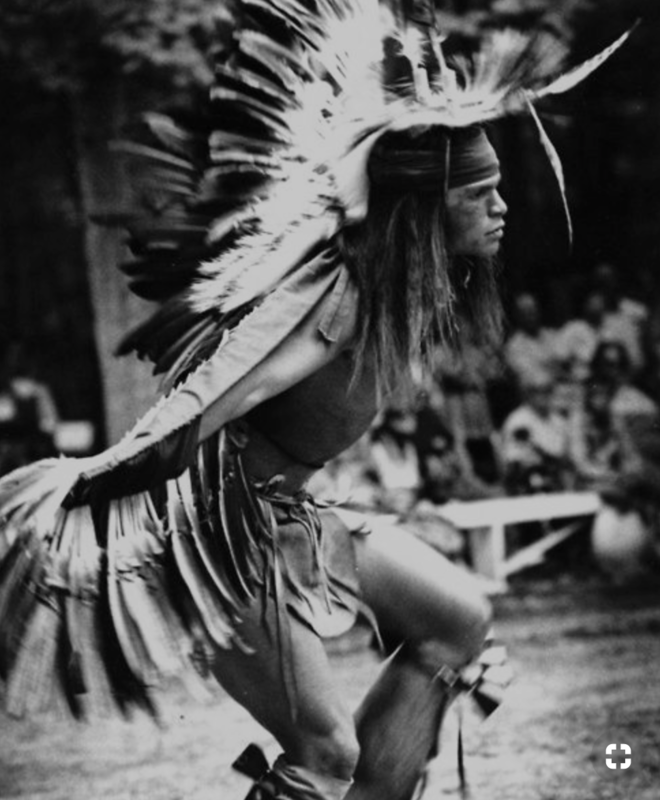 Potlatch ceremonies, gifting rituals for the hunt and fertility and ceremonies to “burn off” the old and restore the new are documented in Hydes work as essential to a healthy society. The burning of the “Straw Man” (or the false self, created for survival in the modern world of commerce and non-gift affirming law) is central to the Burning Man Culture. 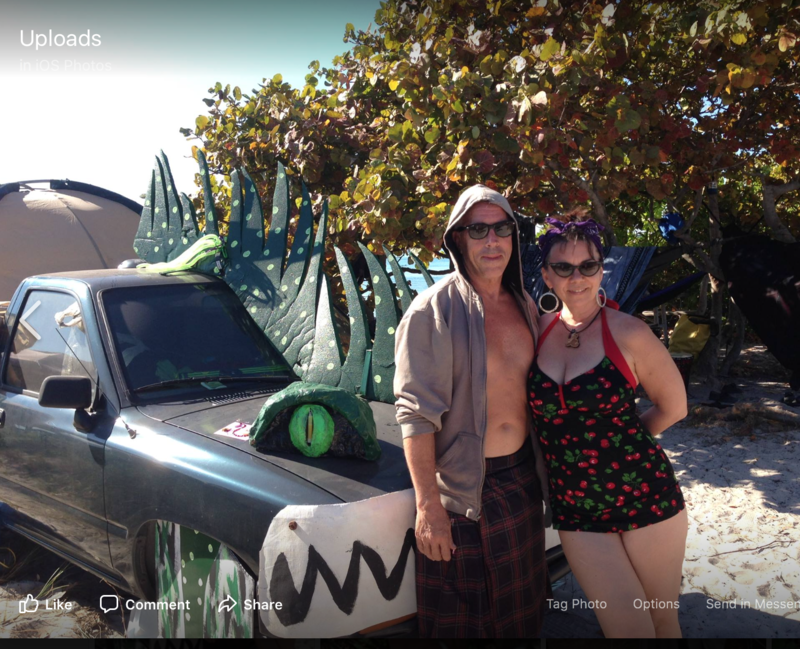 This Regional Burning Man event is called The Love Burn. I journey here, to burn off the false, and renew my True Lover. I go to Miami this month to set up a healing arts camp, serve tea, cultivate dialogue and perform personal poetry in order to distill myself down to my essence and to find the true spirit of Love. May 2019 be the most prosperous and joyful year for you all. I’m not really one of those persons who consults their horoscope at the drop of a hat, but then again, when things are playing out in patterns that seem to be repeating themselves all around you for no discernible reason, it’s a good idea to look for influences celestial. Mercury Retrograde has been in effect since November 16th and will go direct on December 6th. This time I have done my best (as they advise) to take the time to re-do and go inward, instead of taking direct action. Mercury going backward (or appearing to) will be very hard on Yang processes (like starting a project, anything mechanical or technological, and direct communication.) So the best thing to do is anything that is prefixed by “Re” (Like reflect, review, renew, reunite, reconstruct. ) You get the picture, right? Now, for a very social, Five Element Acupuncturist, staying home to journal and practice Yoga can become a little confining during a three week retro-cycle, so I took the time to re-connect with community last week as a part of my Mercurial observation, and I was well rewarded. My great friend Hayes Paden, MA, LPC attended the Blue Ridge Community College Branding Conference on Thursday with me and we had a blast! The conference was sponsored by the SBC, Brand Door, and Asheville SCORE among other great business and marketing groups. Incredible speakers and presenters like Phil Davis of Tungsten Branding and Gary Heisey, founder of Brand Door inspired me to bump it up in the ongoing marketing and Branding research I am building for Huang Di: The Yellow Emperor Mobile Acupuncture and Herbal First Aide Clinic project. Tag lines and elevator speeches are ringing in my head! Jason De Los Santos of Remedy Health and Wellness caught me by the coffee table to exchange a few words about the power of choice as Phil Davis put it in his keynote address. We both agreed that the choices you make every day in business should reflect your brand (or basically what you stand for personally.) Brand, to me, is a buzz word for personal integrity, or how you present yourself to the world. Community Health is a huge component of Huang Di: Yellow Emperor Mobile Acupuncture and Herbal First Aide Clinic project. Health Education is another major role in bringing Alternative Modalities, Herbal Remedies, Qi Gong, Yoga , Nutrition awareness and self care information into populations that may not have access to these types of treatments and ideas. These ideas and great connections contribute to my Brand Reflection – Review – Reconstruction during this planetary phase of renewal and strengthening, before the dark of Winter. Some say Mercury Retrograde is a bummer … but I say it has been a great opportunity to go within and strengthen ideas that will emerge in Spring! Happy Holidays! 2018 has been a time of great strides toward reuniting old skills and new knowledge for me personally. I have come back to Asheville and have been working at Golden Needle Acupuncture Herb and Medical Supply Company, having a daily dialogue with Acupuncture Practitioners and herbalists all over the country who call in to “talk shop”, order needles and herbal formulas, and often ask for advice and guidance in choosing the right formulation or treatment. More often than not the conversations became a giant download on my part (I like to call this my 4th year of Grad School ) as I often have very experienced herbalists and Acupuncturists on the line who will discuss essential Chinese Medical theory with me. Given that I am in the midst of study for board qualifying exams, this is a godsend! I am extremely thankful for the friendship and exchange I have had with Michael Max of late, who produces and hosts Qiological , a podcast sponsored by Golden Needle. I made a few commercial spots (in the ‘Doughnut” style as we call them in the industry) for Michael to use as a tease at the top of the show and then more information later in a break in the middle of the show. Joey Bedrosian helped me produce them, and we sent them off. Michael gave the early offerings a listen and asked for some revisions in a conversation on the phone that devolved to a good humored ribbing and a few jokes about doughnuts, bagels and even bialy buns and what they might sound like. We settled on these spots that I ended up dusting off my Neuman microphone and bringing in to the warehouse to re-record. Michael also asked me about my former career in Voice over and the new marketing ideas i have been trying out to promote Golden Needle on social media and to start up interest in Huang Di: The Yellow Emperor (my 34′ school bus that I am converting into a Mobile Acupuncture and herbal First Aide Clinic.) This lead to a great invitation to be a part of the Qiological offerings in a special interview that will be included in the “Qiologician” side of his show to help Acupuncturists with their marketing strategies. Check it out on his site. Michael work is no ham sandwich, neither could it be called a bagel …. even the kind with lox and a schmere…. It has been some time since I have written in the Puja journal. Just to update this account, I made it through my formal Chinese Medical training with a diploma. My studies will never end, however. Neither will the tests (some in the form of exams some in the form of the things life gives us to overcome.) I will be taking the first of my NCCAOM board qualifying exams soon. The journey that has gotten me here has been a bit longer than my classmates I imagine, but it does no good to compare. I am working for Golden Needle Acupuncture, Herb and Medical Supply Company, helping practitioners and students of Chinese Medicine to choose formulas, needles and moxa for their clinics, and learning more every day. The great metaphor for learning; The School Bus, has finally become a reality. I purchased mu 34′ foot Thomas schoolie with a Caterpillar diesel engine and Allison drive train a few weeks before graduating from Academy for Five Element Acupuncture. It has taken me from Gainesville, FL to Stockbridge, MA and back, where Lonny Jarret, Author of Nourishing Destiny named it Huang Di: The Yellow Emperor. You will be hearing more about The Yellow Emperor in the coming weeks. For now it is good to say “I am back.” I am in my hometown of Asheville, NC again and near my children who are no longer children. I developed a movement group in Gainesville, FL that I hope to start up again here, called 5 Element Movement. It is an adjunct therapy to 5 Element Acupuncture and will be a key component to my practice. So will the Mobile Acupuncture and Herbal First Aide Clinic called Huang Di. Happy Holidays to you all. It has been a couple of years since I have blogged on The Puja Eyes Medicine Show site. 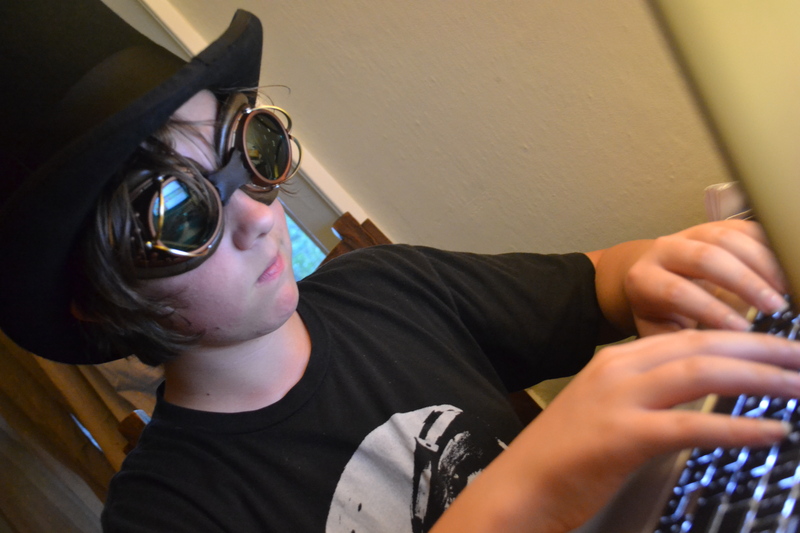 The last entries were from an excellent guest blogger, my son Ian, during the summer of 2013, when we explored “An Apothecary of Ideas” (his phrase) on our cross-country trip to the Wakarusa Music Festival, in Arkansas. On the way we explored Honky-tonk and Country Music, in Nashville, TN, and The King of Rock and Rolls palace in Graceland. We listened to electronica, gypsy punk, and various music fusions that would be featured at the festival and we asked: “What does music and festival have to do with health?” What do travel and making special costumes, and practicing our unicycle skills in preparation for an event have to do with our well-being? We asked ourselves that question as we huddled in 40+ mile an hour winds, hail, and torrential rain on Mulberry Mountain at the festival the first day. We asked that question of many of the festival-goers in the coming days as we trudged through cake-batter thick mud up to our shins, took pictures, and did our best to inquire about festival, music and health. What we discovered was community health, community dance, art and celebration. We discovered the bond that exists between strangers who adore the same band for their own private reasons, but for the similar story that that music spoke to their authentic self. 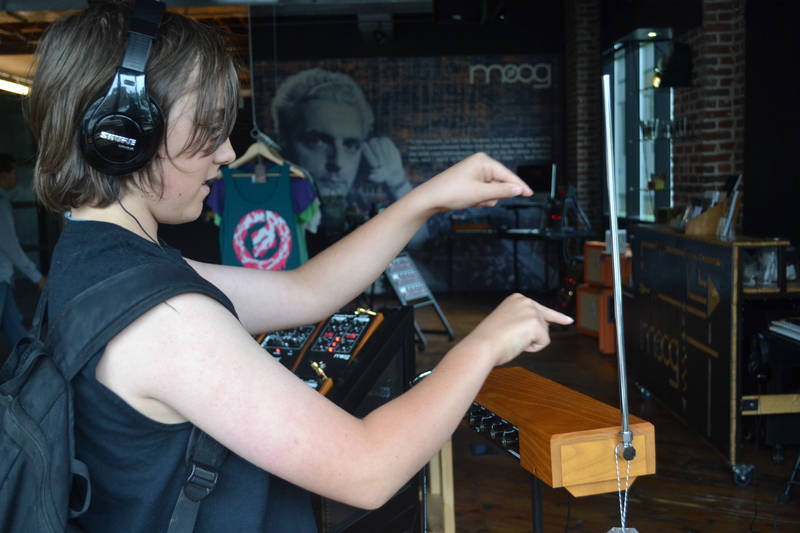 Later that summer, my son and I visited the Moog factory in Asheville, NC and Ian added Bob Moog’s sentiments about the importance of music to the PEMS Apothecary of ideas. Reading back over the posts I am (of course) finding grammatical choices I wish I had not made … and missing my boy-now-turning-man as he approaches his 15th birthday this week. Much has changed in our lives since Wakarusa 2013. Ian and I live in separate states now as I am pursuing a long-desired goal of becoming a licensed 5 Element Acupuncturist and Herbalist at The Academy for Five Element Acupuncture in Gainesville, FL, and he is in a great high school in Asheville, NC, and living in a house of bachelor-artists, including his dad. We have not been documenting our times together, as we just focus on each other during visits. Ian is the best “Technical Inter-Post” blogger (a job title coined by him) that The Puja Eyes Medicine Show has ever had the pleasure of working with. I hope he will write a few lines again for us soon. Happy birthday, son. 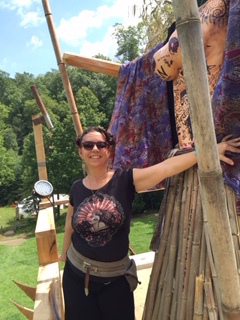 After hearing about the Burning Man Festival for many years, and knowing the developers of the regional burn movement in Asheville, I finally got the opportunity to attend Transformus this weekend. “ A wild world of self-expression, music, art, games, amazing performances, gatherings, meals, shows and magic…where strangers are best friends.” Is how it is described by its founders. I found the 10 Principals to be inspired by the Rainbow Family Gathering and expanded to be very creative and community-art centered. Inclusion, gifting, decommodification, self-reliance, self-expression, communal effort, civic responsibility, leaving no trace, immediacy and participation are the ideas that are taken very seriously at “The Burn”. The experience has achieved its title. I am transformed. At present the impact is still sinking in. I thought it important to document here, as personal transformation is a theme in the “Apothecary of Ideas” that leads to better health. I went as just me. Although I did pass out a few tins of Slippery Gypsy Aphrodisiac Mustache Wax as gifts, The Puja Eyes Medicine Show was not the focus of my visit. Preparation for the next chapter of my life was. In a few weeks, I will be entering my clinical year of training. The culmination of a 3 year Masters Degree program in an ancient form of Acupuncture, preserved from texts that date back thousands of years in Chinese Medical History; Five Elements Medicine. I will be seeing patients under the experienced direction of teacher-practitioners who have preserved this shamanic art, along with its rescuer/founder J.R. Worsley for much of their lives. It felt right to go home to the Asheville area to burn off what is no longer needed and become inspired for the work ahead. This is the documentation of three events that hang together for me in my experience … along with all the other wonderful, creative, hilarious and sublime moments that only this kind of a gathering can elicit. There are moments that cannot be spoken of, or recorded.. In fact photography without consent …. Anything without clear consent, is not allowed at the burn. There are images of some of these events at the official website: http://www.transformus.com this is the record of the images that I carry now, in my minds eye. Three descriptions follow of what I witnessed as visceral demonstration of the most important principal of the Burning Man Culture, Immediacy. “To overcome barriers that stand between us and a recognition of our inner selves, the reality of those around us, participation in society, and contact with a natural world exceeding human powers.” Immediacy is the definition of the work of Five Elements Medicine as well. It is what I came seeking. The effigy was already in place in the middle of the burn field as we entered the grounds. It was a high tower with a scarecrow-like effigy of a larger-than-life woman at the top. We were encouraged to paint, write climb and affix our prayers to her and the structure before it was to become a structure fire on Saturday night. I labeled her as an aspect of myself that no longer serves. Watching her burn ignited a deep wisdom and confidence in me. To describe the upper pond at Transformus is to borrow from the great filmmaker Frederico Fellini. With “Life and dreams as raw material” the scene on the lake would defy ordinary description of a party. 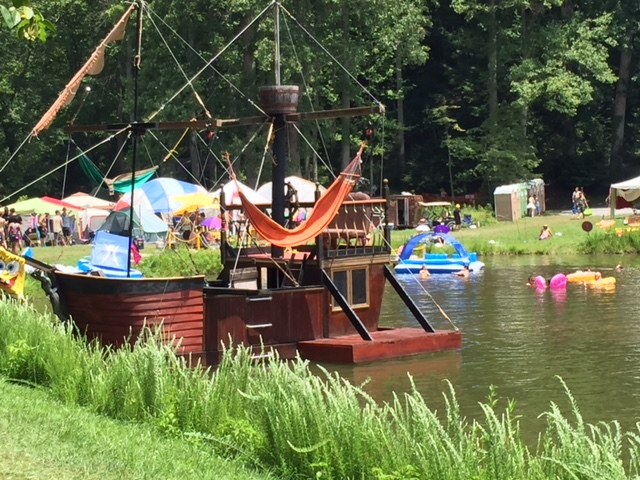 The pirate ship “Molly Roger” draped with lounging bodies in various costumes, including those we were blessed with at birth, party floats bearing equally jolly guests, a fake VIP beach, roped off in gold chains and a giant, invisible blow up ball that 2 to 3 people could roll inside and into the lake, where they would self-propel by walking inside. These were some of the dreamlike aspects of that Sunday afternoon. Laughter and music filled the warm scene. Pure paradise. From across the pond with a perfect view of the VIP beach, I noticed a stark shift in the energy. A ranger was running and shouting around the lake. A canoe was being guided in to shore. The body of Jay Houston Marx was dragged out of the watery playground, and silence fell on the football field size lake. The trained crew was quick and decisive. From across the water I saw them working resuscitation techniques that I have yet to be trained in. I searched my memory for the acupuncture points indicated for drowning, but knew my place was out of the way. They worked for several minutes to silent prayer and an occasional shout of “Breathe!” from the watery mirror of transformation that was the lake. We all joined as one to will life into our friend Jay. The first responder crew did not give up for the eternity that may have been only 20 to 30 minutes before the EMT ambulance arrived. He threw up a few times … we cheered. We had hope. Jay Houston Marx transformed later that day. He burned off the part of him that we may have danced with or kissed or caressed the evening before at the music and dance parties all over the grounds. He went home. “Welcome Home” (like the custom from the Rainbow Family Gatherings) is the phrase repeated again and again by rangers and volunteers at the gates of Transformus. No one knows what accident or incident caused Jay’s transformation. We can only welcome him home now. That night, in the second fire of Transformus his spirit was welcomed in and his name was spoken. This was a somber event. 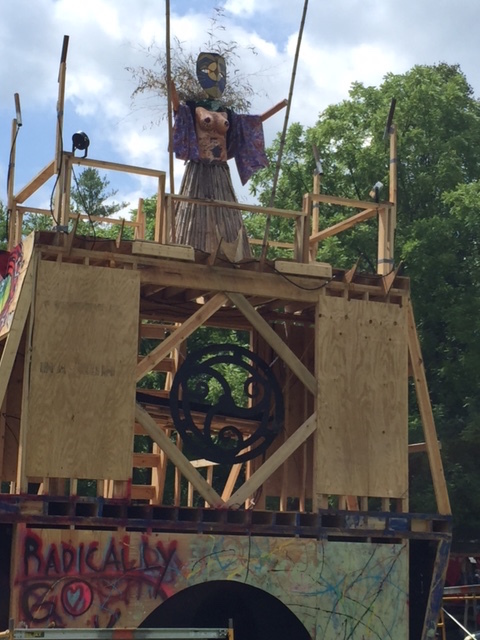 We watched in subdued mood as a beautiful sculpture that depicted the head of a human, and had been a “booth” that we could enter to write to things and people we wished to remember and release during the festival was set in a funeral pyre of wood, tiny blue dolls, art and notes. It burned in relative silence. I went to bed while the glowing embers were being tended. 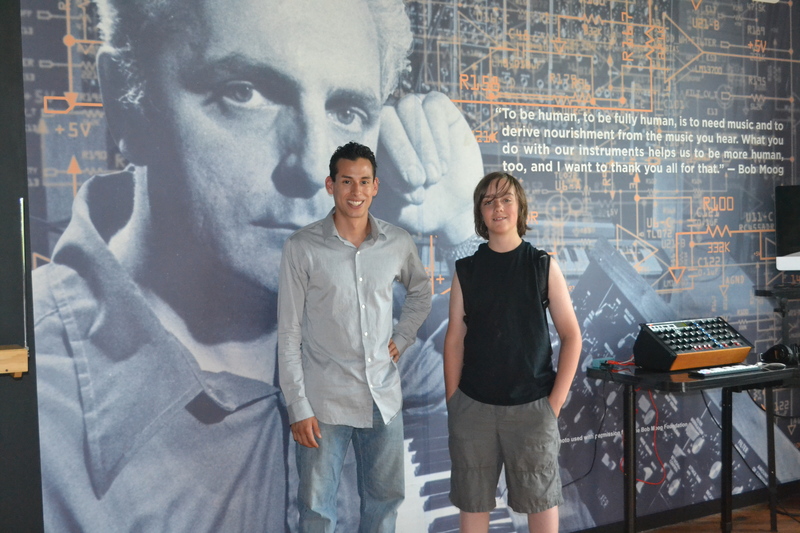 We recently visited the Moog factory here in Asheville, NC, where Bob Moog’s wonderful synthesizers are manufactured. This is me and Rob Grey in front of a picture of the man who changed music history with his famous “creamy sounding” electronic analogue musical devices. Rob (BomBassic) was our tour guide around the factory and is also playing at the One Stop here in Asheville on July 24th (if y’all want to see what he is about, go to bombassic.com). Fun fact: Bob Moog sold theremins like this one to fund his degree in engineering from Cornell university. We’re raising money for college too with the funds we make from selling slippery gypsy aphrodisiac mustache wax as well as other Puja products, so buy a tin or two to fund my college education. So anyway,we found out a lot of cool stuff about Bob Moog and his awesome products, like 75% of the materials he uses are from the U.S. and 100% of his finished products were made and tested in the U.S. by people. Its no wonder his employees are so loyal to him, as aptly illustrated by Nick Montoya. 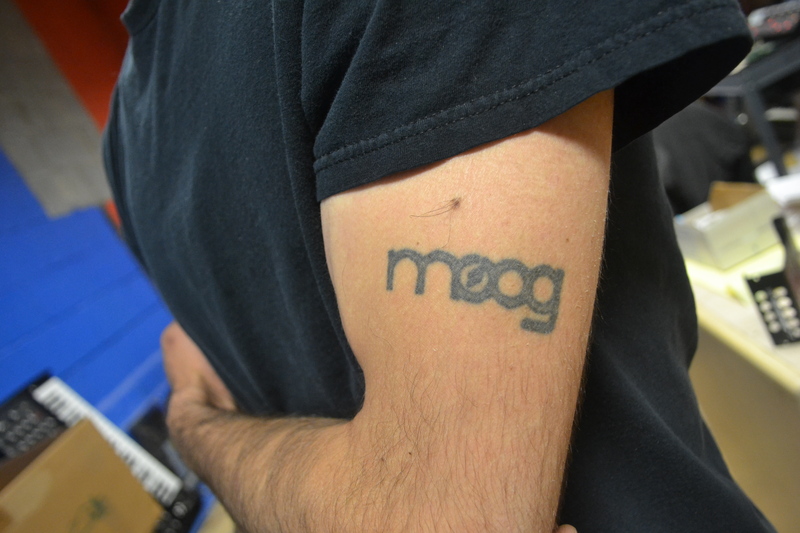 Nick works in the service center (the only service center for Moog insruments) and did I mention that he has a Moog tattoo on his arm? We continued on with the tour, passing Sub Phattys and Little Phattys on stands (they keep them powered on for 48 hours strait to see if there is anything wrong), workstations, tuning rooms, and a gold plated Mini Moog (only 11 made!) until we made it to the Sound Lab. 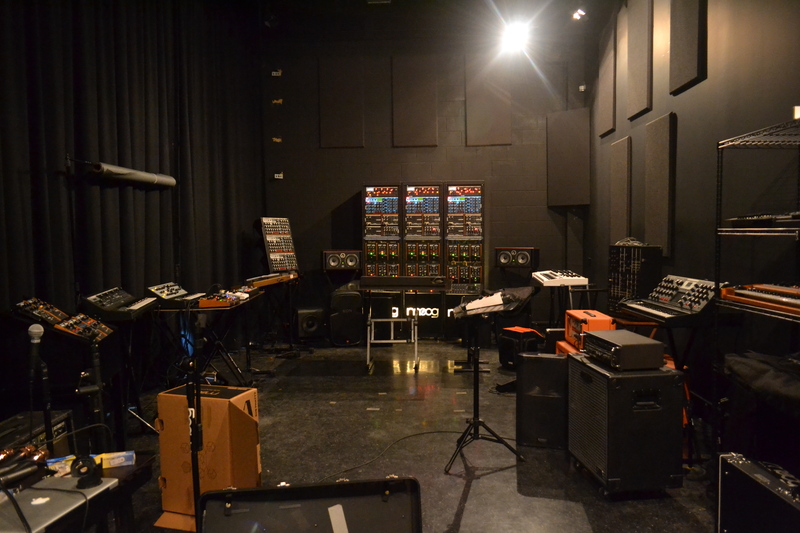 The Sound Lab is where musicians go if they want to test out Moog and see if its right for them, or if they just want to jam. 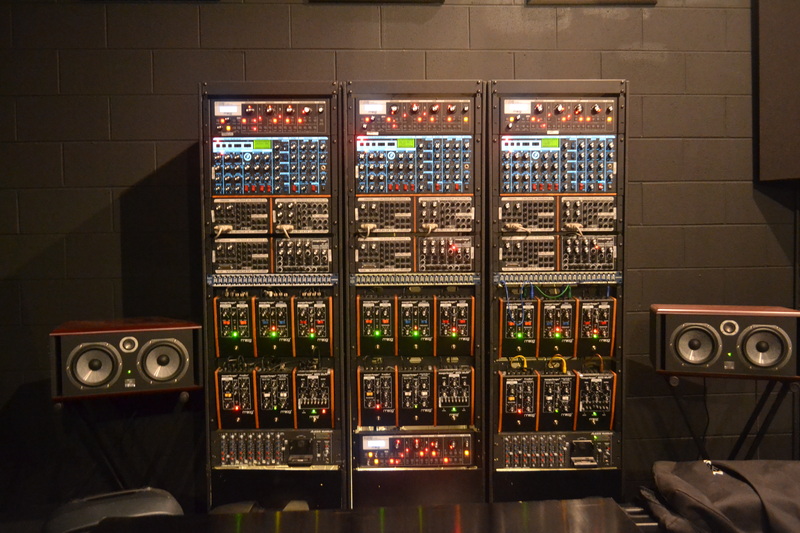 It has modular system hookups, Voyagers on racks on the walls, and pretty much every Moog product in the world. I believe it’s what musicians call heaven. Anyway, I have to go now, so see y’all in the funny books! Oh wait, I almost forgot to put a picture of the Sound Lab! We at The Puja Eyes medicine Show Agree with Bob Moog. If you derive nourishment from this post please leave a like or retweet. We love your comments too!